At the beginning of March I posted about the gorgeous Soigne Fruit Marbles collection that I bought for my mum for Mothers day. My mum loves the set and has used it none stop since, so I knew at some point I wouldn't be able to resist adding either the Fruit Marbles or Macaron collection to my collection. When Soigne offered a 40% discount code over Easter that worked on every product on the website, including both of these currently reduced collections, I decided to use some money I was given for Easter to treat myself to the Macaron collection. I could have sworn that the Macaron collection was called the Marcaron collection and actually wrote this in my post about the Fruit Marbles collection (I've changed it now), but apparently I was wrong! The Macaron collection comes in a beautiful pastel pink box that as I've mentioned before looks like it should contain pretty pastel macarons. Both my camera and phone camera completely refused to take a decent shot of the box but you can see it in the picture with the varnishes standing on the top. 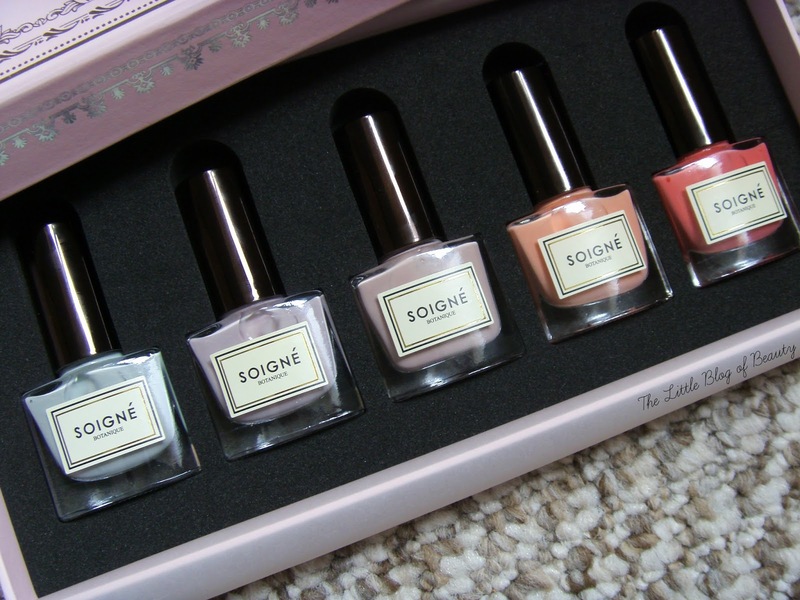 The box contains five pretty pastel/neutral shades. 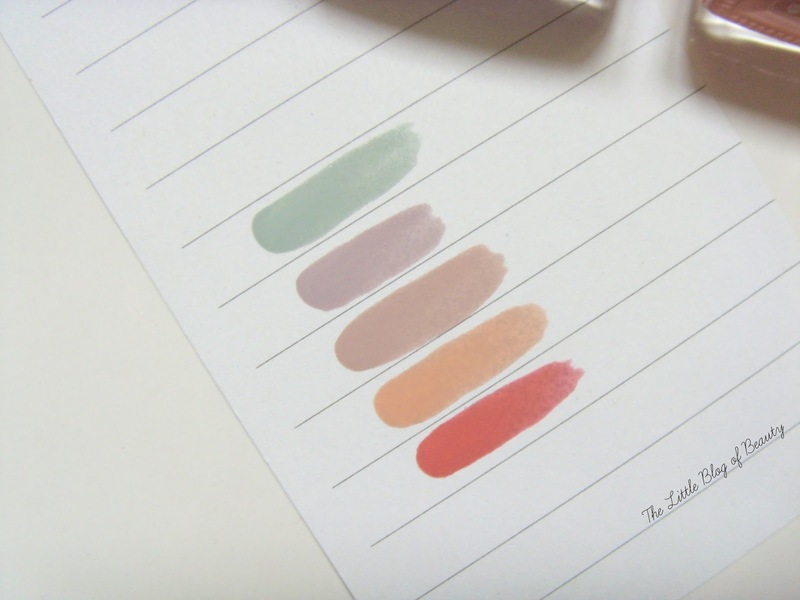 Pistache is a delicate grey based green, Lavande a clean, fresh lilac, Caramel a pale caramel, Fruit de la Passion a pale peach (described by Soigne as passion fruit but I'm not sure about this) and finally Petale de Rose is a pale rose pink. As I said in my post about the Fruit Marbles collection these are five free and made from up to 85% plant-sourced natural ingredients. When I ordered the Fruit Marbles collection for my mum I also ordered a single shade for myself in the sale so I already knew that these nail varnishes are a pleasure to apply. They have a reasonably wide brush and a quick drying formula that isn't too thick but also isn't too watery either. As with many ranges some shades are more opaque than others. With some of these I think I could get away with one coat but others probably need three to be perfect. I thought as these are made of mostly plant-sourced materials that this might mean that they're less durable than other more chemical based nail varnishes, but I've actually found these to be pretty hard wearing. I'm really impressed with these nail varnishes and would definitely like to add some more shades to my collection in the future. If you like the look of the Macaron collection this is still half price at just £19, so I'd hot foot it over to the Soigne website before it sells out! Which is your favourite shade in the Macaron collection? Oh wow, they are such pretty polishes! I love the colours :) at first glance I thought they were some sort of lipstick as they just look so creamy?! This is such a lovely collection, I love the shades!